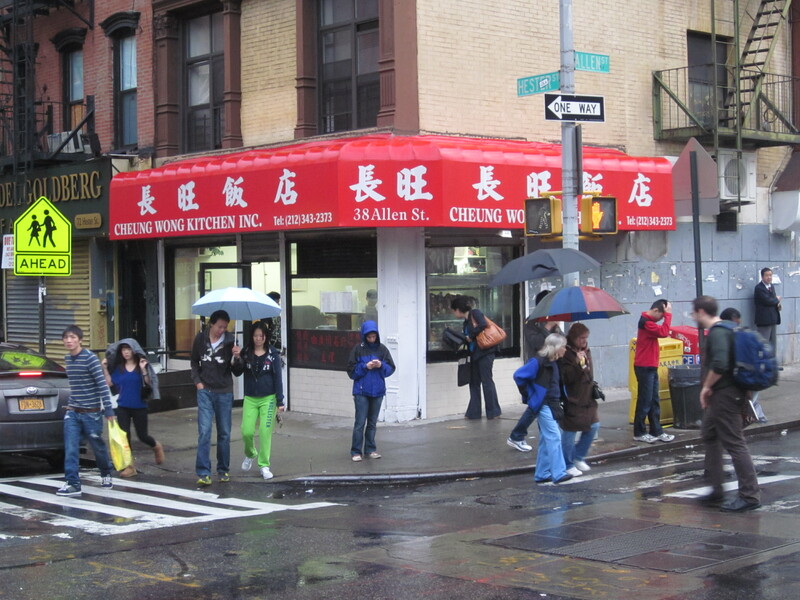 The man in the red nylon sweat suit smoking a cigarette saw me peering into Cheung Wong Kitchen as I waited for Zio to waddle over from a half block away. 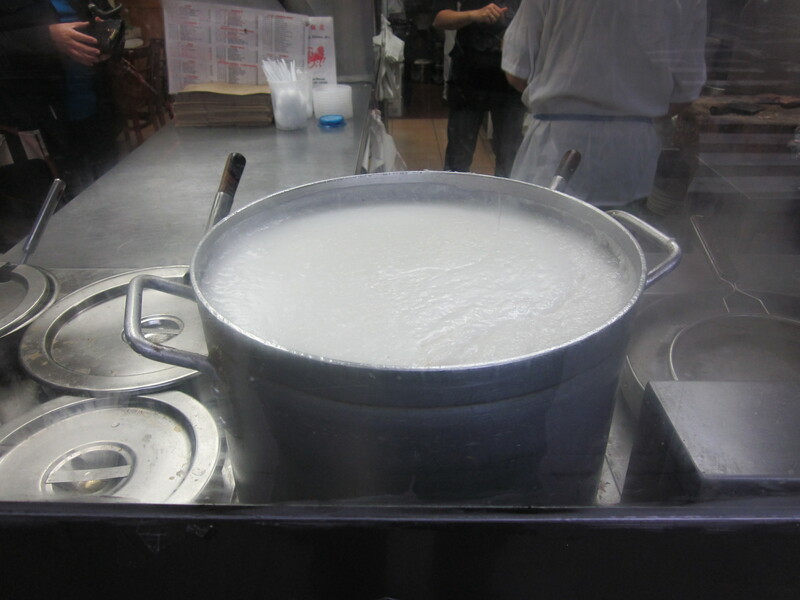 I could see a bubbling cauldron of congee through one window while in the other hung roast ducks and chickens. There were only a few tables inside the small, somewhat dingy restaurant and most were occupied. One big round table was empty except for a carton of green beans that were about to be trimmed for cooking. It was starting to rain. There were other places we could go that had more space and maybe better, more comfortable accommodations. I looked at Zio. He was thinking the same thing I was. 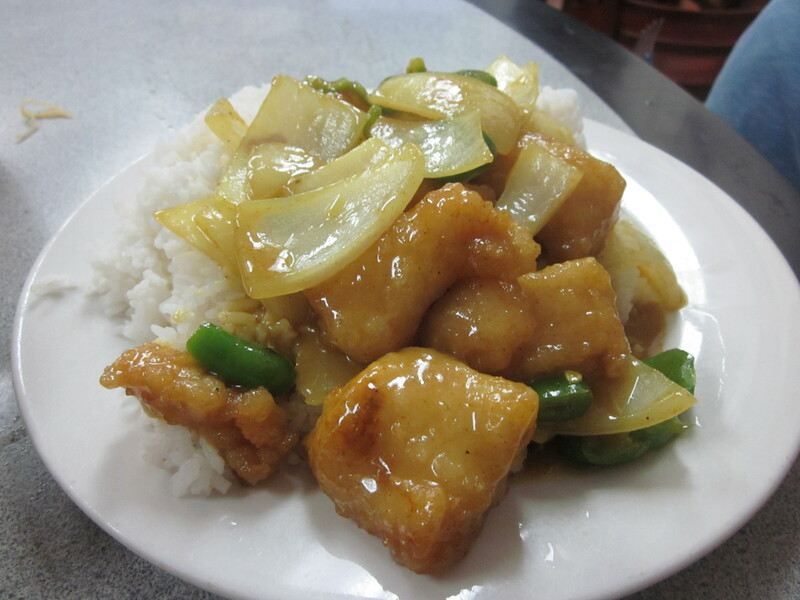 We were on Allen Street in Chinatown, a few blocks east of Canal; comfort and space just were not the point. “Let’s go in,” he said resolutely. The lone waitress placed two settings on the round table where she was also trimming the green beans. We glanced at the menu. There were traditional Cantonese items on one side of the menu; chicken with black bean sauce, roast pork lo mein, sweet and sour shrimp, etc—most priced more than five dollars. I zeroed in quickly on the rice plates and was intrigued by something called “double favor” on rice. I’m very used to misspellings on menus and never hold that against a restaurant. I see no correlation between a few spelling mistakes and good food. I assumed here that “favor” was meant to mean “flavor.” Still, when the waitress came over to take our order I had to ask. “Double favor is chicken and duck, or pork and beef,” she said, in, frankly, very good English. I understood her answer to mean that it was a choice of two meats on rice. So I had to make a decision. 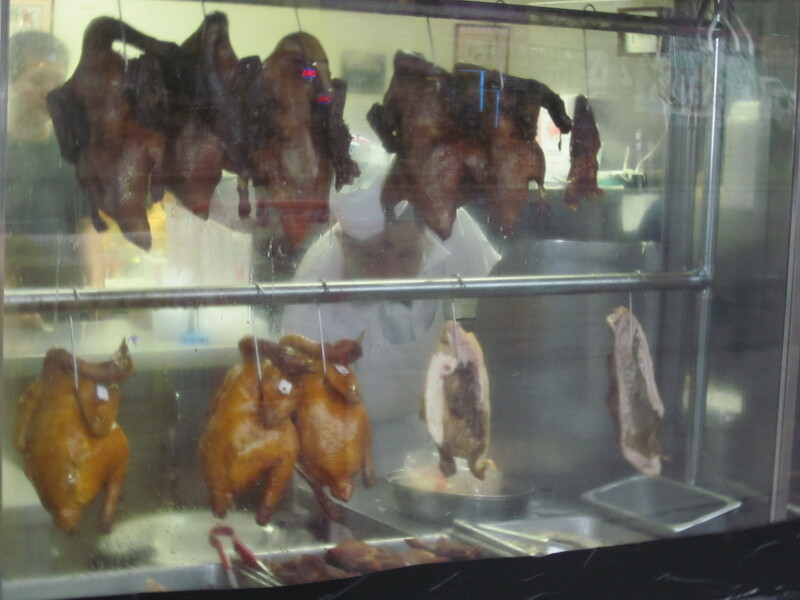 The soy sauce chicken that I saw hanging in the window looked tempting. I paired it with what is usually an old reliable at a Cantonese place: roast pork. Zio bypassed the meat and decided on fish stew with curry sauce on the rice. I suggested to Zio that we should try something else on the menu. The additional item would increase our budget to around $7 as opposed to $5, but I didn’t think Zio would care as long as it involved more food for him. And as I suspected, he endorsed my suggestion of beef stew with wonton noodle soup. But there was a stipulation. “Shouldn’t we just spring and get one each. It’s only $5.50.” he whined, thinking I was being even cheaper with my money than I normally am and worrying that maybe it wouldn’t be enough for our collective king-sized appetites. I told him to look around at some of the bowls others in the restaurant were slurping from. And it was more than enough. 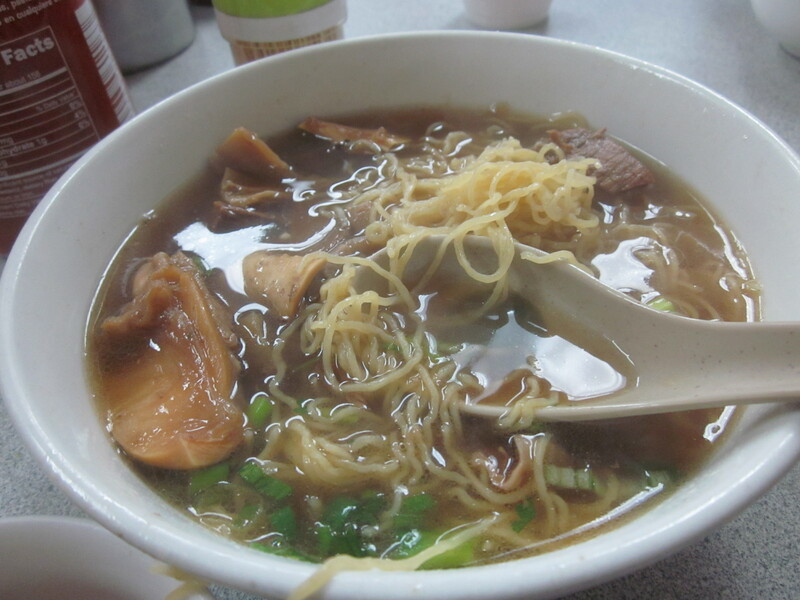 The big bowl was brimming with fat encased beef in a rich meaty broth, thick with noodles and small tender pieces of winter melon. While we ate the soup, the waitress took a few more minutes at our table to continue trimming the beans and then left, returning quickly, even before we could finish the soup, with our rice platters. Double “favor” over rice: soy sauce chicken and roast pork. 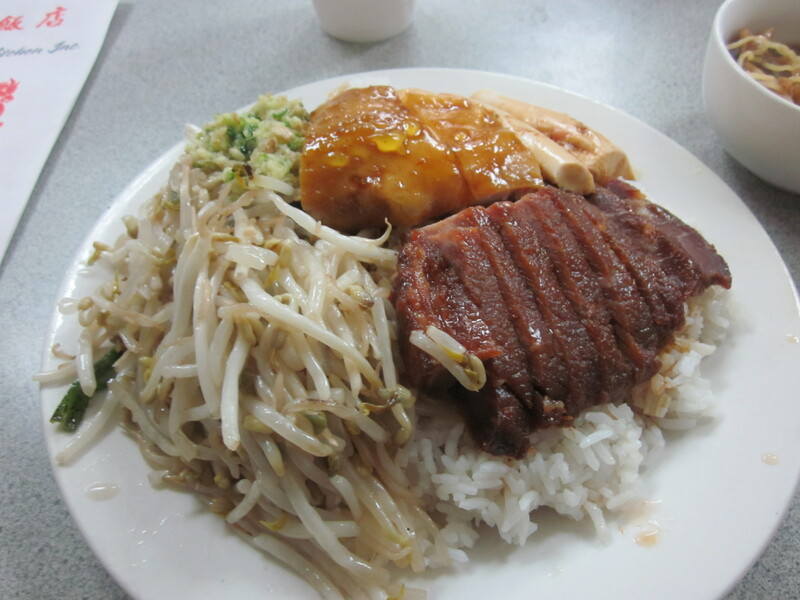 The chicken and pork were chopped into slices and arranged neatly over the rice. Both were served at room temperature; the chicken incredibly moist and easily pulled from the bone and cartilage, while the pork tasted almost like jerky, but subtly sweet from the hoisin sauce. This favor, or should I say flavor, was addictive. I worked through the mound of food in front of me methodically, matched only by Zio’s devotion to the chunks of white fish, fried and smothered in a yellow curry sauce. Eventually it was all gone with the exception of a few spoonfuls of broth from the beef stew soup. Our check came. We ate $7 worth of food each. If $5 was enough for a king, what did the additional two dollars make the two of us if not kings? The man in the red nylon sweat suit was no longer outside to ask.